A method of estimating a horse’s weight has been developed by staff at the New South Wales Department of Agriculture. Wouldn’t it be great if you could take your bathroom scales out and get your horse to pop on board? No such luck. Aside from most scales maxing out around 130kg, there’s also the small matter of a leg at each corner. Scales capable of weighing large animals such as horses and cattle are very pricey. That means we either have to find another way of weighing them, or use some other method of calculating weight. Why do we need to know the weight of a horse in the first place? You may need it to give the animal an accurate dose of medication or a wormer. Your horse’s weight is also important when working out daily rations. It’s important that doses be as accurate as possible. Under-dosing runs the risk of building resistance in bacteria or internal parasites. Overdosing is an expensive waste of medications and can create unpleasant (and unnecessary) side-effects. Firstly, we can get an approximate idea of the weight of a horse from tables that work off height and type of horse. As the weights for each type indicates, the range is considerable. A more accurate way is to use a means of calculation based on the dimensions of the horse. One such method has been developed by staff at the New South Wales Department of Agriculture. 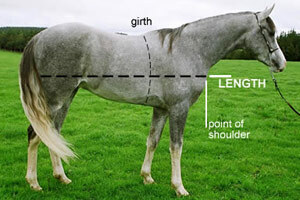 then multiplied by the length of the horse (in centimetres) from the point of the shoulder to the point of the buttock. This number is then divided by 11,000 to give the final result. Officials have found this method to be quite accurate for most horses, but it can be out by up to 50kg in extreme cases. Another option is to use a weigh station, like the kind at rubbish depots where cars and trailers are weighed coming in and then leaving, and charged on the basis of the difference. Some weigh stations will allow you to do a weigh-in for a modest charge, but always check first. It’s pretty simple: Take your horse down in your float, and weigh in. Remove the horse and weigh again. The difference is naturally the weight of your horses. Load up and head for home. It’s possible you might have a friend who has a set of scales capable of weighing big animals. Most of these are designed for cattle, so you need to ensure that the way it is set up is safe for horses. The last thing you want to do is snag a leg. Owners who don’t take their horse for a weigh-in need to build a picture. For example, if the above calculation ties in nicely with the table based on height and type of horse, it’s pretty likely your estimate is pretty accurate. If there’s a discrepancy, apply some common sense. Is your horse a heavier or lighter type? Perhaps you could hunt out another method of calculating weight and see what result that delivers. Without scales, it’s certainly not an exact science, but you should be able to get an estimate within a few kilograms.